Retrofit solution. The air handler in a ductless heat pump system can be permanently installed on a wall or ceiling. This system provides the convenience and efficiency of central air conditioning without the ductwork system. A ductless unit is a great option for homeowners who want the comfort and convenience of central air conditioning in a house that doesn't have a ductwork system. 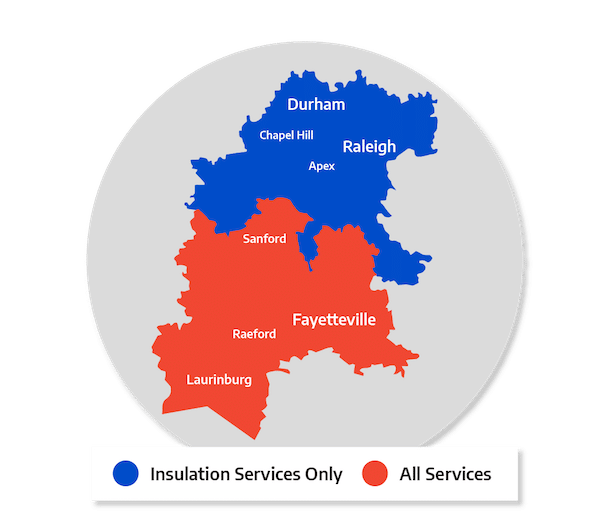 Comfort Services, Inc. is the local air conditioning contractor in Pinehurst, Southern Pines, Aberdeen, Apex, Garner, Chapel Hill, Fayetteville, Durham, Fuquay Varina, Fort Bragg, and other nearby areas. As such, we offer free estimates for split air conditioner installation or replacement! Contact us today! Today, ductless "mini-split" heat pumps provide homeowners and contractors with a permanent HVAC system option that is well-suited to retrofit applications. Unlike a conventional forced-air system that relies on a network of ducts and a large, centrally located air handler, a ductless system includes smaller air handlers that are permanently mounted on the wall or ceiling. Each air handler is supplied with electricity, a refrigerant line connected to an outdoor compressor, and a condensate drain line. The unit typically has remote as well as console controls, and blows conditioned air into the room. Depending on its size, a single exterior compressor unit can supply one or more room-size air handlers, and each air handler can be controlled independently. Most mini-split systems are designed as a heating and cooling system. As with other heat pumps, the heating mode doesn't work efficiently when temperatures are below freezing. Contact us today to schedule your written estimate for air conditioning service in Aberdeen, Pinehurst, Southern Pines, and other cities including Chapel Hill, Garner, Apex, Durham, Fuquay Varina, Fort Bragg, Fayetteville, and more. We also offer a home energy audit to help evaluate and diagnose the causes of your home's possible energy problems or discomfort.